Half a mile east of this site are the ruins of an earlier motte and bailey castle. 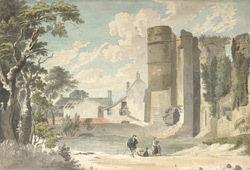 This stone castle was begun in 1170 by Robert Fitz Randoff. The keep, which measured 105 feet by 80 feet, was one of the largest in England and had walls that were up to 12 feet thick. The castle's main purpose was to guard the road between Richmond and Skipton and the nearby settlement of Coverdale.